Your driveway and patio have turn into so soiled that they are getting dangerously slippery? Order the services of Excellent Carpet Cleaning. We are a professional jet washing and hard floor cleaning company offering first-class cleaning services in Barnet ENat an excellent price. We will gladly provide you with the professional hard floor cleaning, scrubbing, polishing, anti-slip protection, sealing, tile recoat service you need. Our cleaning staff will come with all the modern systems for pressurized cleaning, emulsification, heat and powerful capture of the waste materials. They also have Prochem authorized cleaning detergents which are safe for humans, animals as well as for the environment which are used to eliminate scratches, stains and slippage, for floor scrubbing, pealing and polishing, and for the successful elimination of surface dull spots, watermarks soiling, and micro scrapes from your hard floor. Depending on the type of hard floor being cleaned, the pros may have to perform floor polish stripping before the actual cleaning and buffing is done. Typically, a specialized vacuum is applied, followed by the application of a cleaning spray on the hard floor. Then the cleaner will continue to rinse off and dry the hard floor. 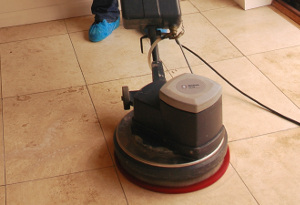 Once the grout surface and floor have been properly cleaned ongoing protection is accomplished with an impregnator. The seal and polish for protection is used to make sure that the floor is preserved from the accumulation of staining and dirt. Our cleaners will use jet washing for the outdoor cleaning of your paths, decks and drives. We can offer high quality patio cleaning and driveway cleaning with the help of strong, professional pressure washing machines. Our cleaners arrive with the professional cleaning solutions and tools to clean any kind of hard floor outdoors or indoors. The floor is hoovered with a specialized vacuum and checked out for any stains and other dirty areas. If there is polish or other sealing on the flooring, it is eliminated with the appropriate instruments. The solutions are tried on a small area before being used. The stains are pre-treated, and then a spray or other appropriate solution is used to wash it. Depending on the type of floor being cleaned, the cleaners may scrub, rinse and dry the floors. For some kinds of floors, modern technology is used for the emulsification, heat, pressurized cleaning, and helpful catch of the waste. Once the grout and floor area have been professionally cleaned and ongoing protection is accomplished with an impregnator. Excellent Carpet Cleaning is a leading hard floor cleaning company, which delivers reasonably priced and yet high quality hard floor cleaning and polishing services, grout and tile cleaning, hard floor sanding service, vinyl floor cleaning, slate and stone floor cleaning in Barnet EN. Our specialised grout and tile cleaning company can offer you professional floor sealing and polishing, interior and exterior stone cleaning, wood cleaning and grout colour sealing and recolouring expert services. We offer reliable and covered by insurance commercial and domestic hard floor maintenance services in the region. We have established a customer support services to administer and process your booking requests within Two hours of your phone call to 020 3404 0500 or your online booking request. You don't need to give a downpayment. The payment of the set price is performed after we are done with the cleaning. Our typical clients, those who book early ahead as well as the local estate companies and property owners are given preferential fees. Clients who book a combination of more than one of our expert services will get big deals. Book our hard floor cleaning and jet washing service right now and let us make your hard floor look as good as brand new once again!